OS X Maverick’s iTunes is, first and foremost, a media manager and player, so here is how to get your favorite media into iTunes. Of course, you can acquire media a number of ways, depending upon the type of media and where the files reside. You can add song or video files you’ve downloaded from websites. Or you can add songs by ripping audio CDs. You can buy music, movies, TV shows, audiobooks, and apps for your iPhone/iPod/iPad at the iTunes Store (and, to be fair, from many other online vendors, including Amazon and Audible). You can subscribe to free podcasts at the iTunes Store (and from most podcasts’ websites as well). 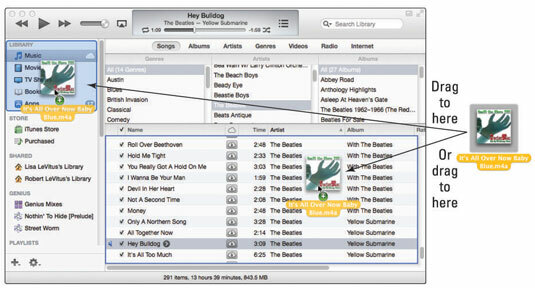 Add a song file such as an MP3 or AAC file from your hard drive. Either drag the document into the iTunes content pane or Library or choose File→Add to Library (shortcut: Command+O) and choose the file in the Open File dialog. In either case, the file is added to your iTunes Music library. Add songs from a store-bought or homemade audio CD. Launch iTunes and insert the CD. A dialog appears, asking whether you want to import the CD into your iTunes Library. Click the Yes button, and the songs on that CD are added to your iTunes Music library. If you don’t see a dialog when you insert an audio CD, you can import the songs on that CD anyway. Just select the CD in the Sidebar on the left, and click the Import button near the bottom-right corner of the iTunes window. Buy your songs from the iTunes Store. Click the iTunes Store option in the Sidebar on the left. From the iTunes Store’s home page, you can either click a link or type a song title, album title, artist name, or keyword or phrase in the Search field, and then press Return or Enter to start the search. 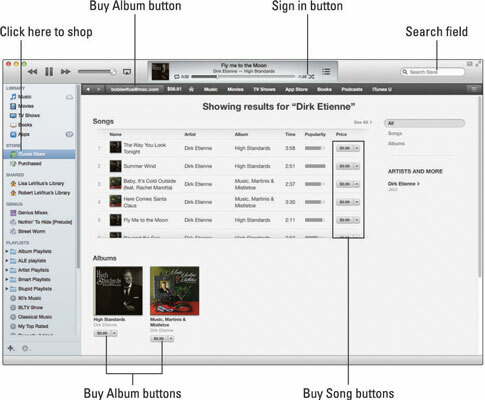 When you’ve found an item that interests you, you can double-click any song to listen to a 30-second preview of it or click the Buy Song or Buy Album button to purchase the song or album. Buy your songs from other online vendors such as Amazon. Amazon has a huge downloadable music store on the web. Its MP3 Downloads section has more than a million songs, with more being added every day. The prices at Amazon are often lower than the prices for the same music at the iTunes Store. The first time you make a purchase from the iTunes Store, you have to create an Apple account, if you don’t already have one. To do so, just click the Sign In button and then click the Create New Account button in the Sign In dialog. After your account is established, future purchases require just one or two clicks. To add a video file such as an MOV or MP4 from your hard drive, either drag the file to the iTunes window or Library or choose File→Add to Library (shortcut: Command+O) and choose the file in the Open File dialog. Click the iTunes Store in the Sidebar on the left. Either click a link or type a movie title, music-video name, actor or director name, or other keyword or phrase in the Search field; then press Return or Enter to start the search. When you find a video item that interests you, double-click it to see a preview or click the Buy Episode or Buy Video button to purchase the episode or video. Click the Podcasts link on the store’s home page. Click a link on the content pane or type a keyword or phrase in the Search field. When you find a podcast that appeals to you, double-click it to listen to a preview, click the Get Episode button to download the current episode of that podcast, or click the Subscribe button to receive all future episodes of that podcast automatically. 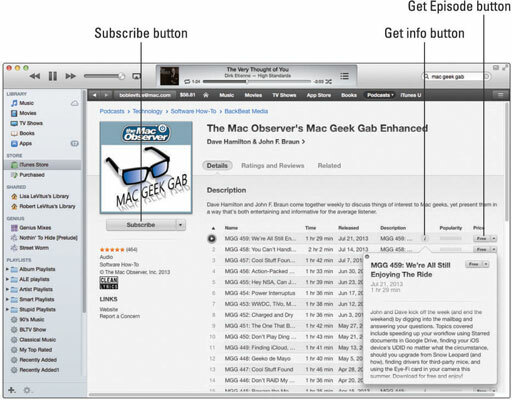 For more information on most podcasts, just point at the little i button on the right side of the description field. You don’t even have to click (though you can if you want to). Subscribing to a podcast is a cool deal. You can configure how often iTunes checks for new episodes (hourly, daily, weekly, or manually) and what to do when new episodes become available (download the most recent one, download all episodes, or do nothing) and how many episodes to keep in your iTunes Library (all, all unplayed, or a specific number between 2 and 10). To specify these settings, choose Podcasts in the Sidebar, click the name of the podcast you want to configure, and then click the Settings button near the bottom of the window.